This is my first time designing a PCB for MSP430. I really like the NRF24L01+ booster pack but I would like something smaller to use for remote temperature sensors. 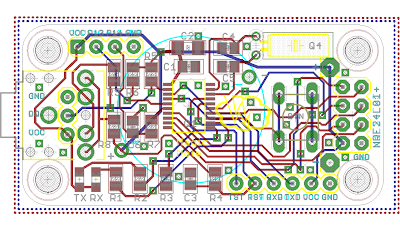 With that in mind I've designed a 24.5 x 50 mm PCB (2 on a 5x5 cm prototype) featuring MSP430G2553 and an adapter for a 8-pin NRF24L01+ module using essentially the same pinout, with the intention of using the Spirilis library. There's a jack socket to connect a 1-wire sensor (e.g. DS18B20), a 4-pin header to connect a temperature/humidity sensor (SHT22 or similar), a programming header that gives serial access, and 3 other general purpose I/O pins. You could connect a thermistor or LM35 to the jack socket by leaving off the 4.7K pullup resistor on the data pin. Power can be supplied by a CR2032 coin cell or via a mini USB and LDO voltage regulator. Based on boosterpack design by Spirilis / 43oh. J.P.Norair's suggestion to control TX/RX leds in firmware rather than hardware. Active low configuration avoids need for pullup resistors and transistors. 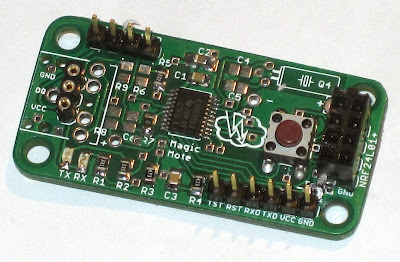 The PCBs arrived from Elecrow a couple of days ago and I populated the first one. This may be the first time I have successfully soldered a TSSOP. This one is configured with a 3-pin SIP header for a 1-wire sensor instead of a 3.5mm jack socket. The 4 pin header will be used for output, so I left off R6 and C6 and substituted 0 ohms for R7. 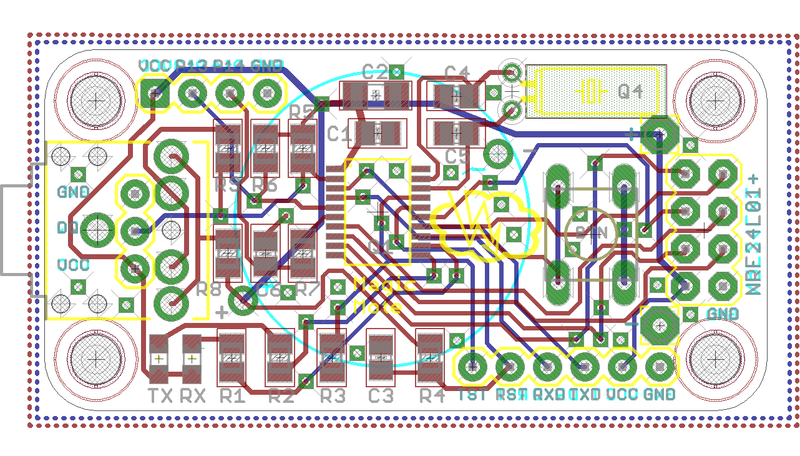 I went backwards and forwards over the orientation of the NRF24L01+ header and eventually decided to leave it so that with a 2x4 female pin header the radio module would extend back over the board. This allows for greater compactness but renders the push button inaccessible. One way around that is to use a right angle female header. Another way is to solder the push button on the back (an advantage of using a through hole button) so long as the battery pack pack is not in the way. Tonight I will try to get a "hello world" blink light demo going to test the microcontroller, and if all is well I will attempt radio communication - at long last! First impressions - LEDs too bright. to help keep Magic Smoke going.